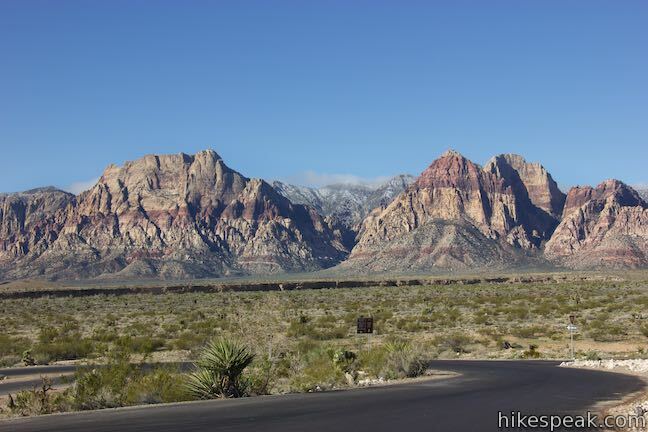 Scenic Drive is a picturesque loop road through Red Rock Canyon National Conservation Area. 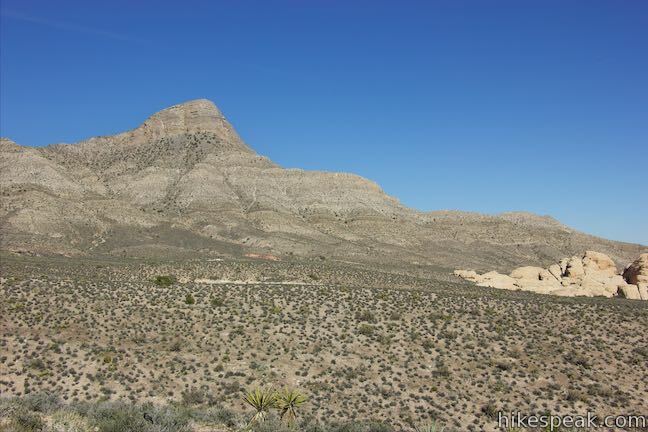 The road offers a memorable drive or bike ride with access to numerous trails and overlooks. 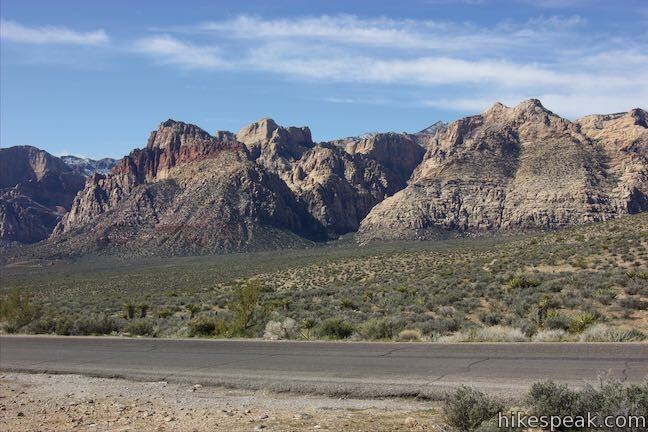 Scenic Drive is 12.5 miles long if you drive straight through and about 13 miles long if you pull off at each of the various overlooks. 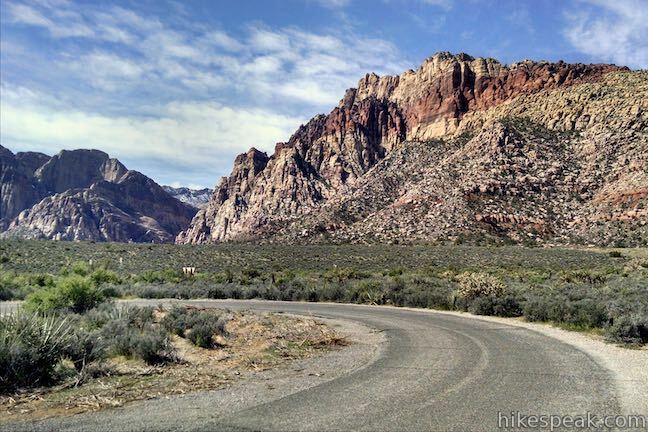 A few things to know from the start: Scenic Drive is a one-way road. 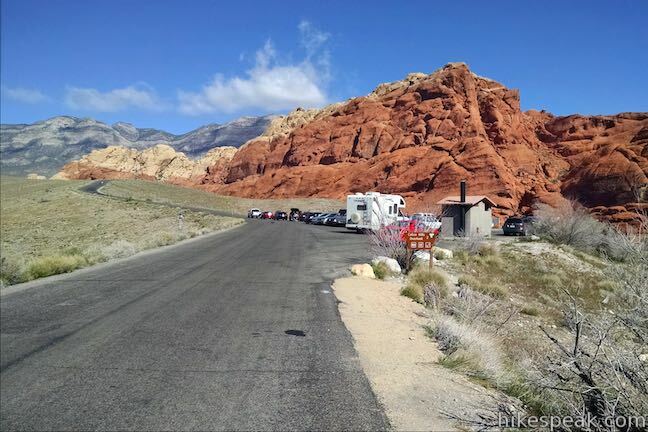 An entrance fee is charged at the start, which is $15 per vehicle, $10 for motorcycles, and $5 for bikes and walk-ins (as of 2018). 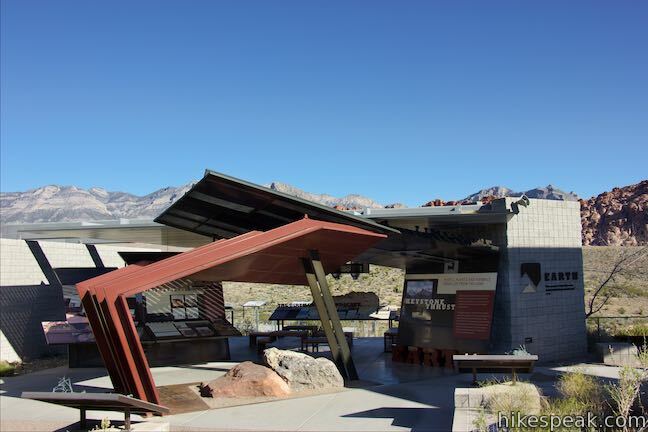 The park visitor center is just beyond the start of Scenic Drive, making it a logical first stop. 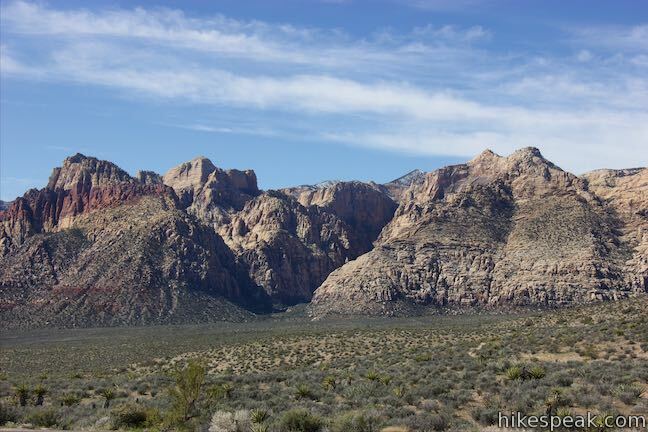 After that, plan your stops sequentially along Scenic Drive. 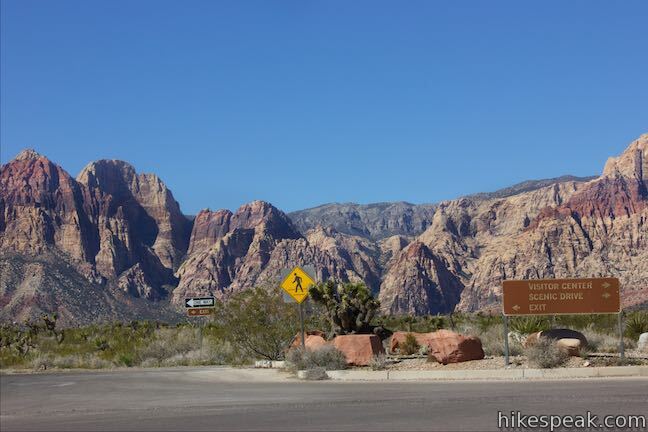 There’s no backtracking on Scenic Drive and when you come to the end of the loop, you’d need to pay another entrance fee (unless you have an annual pass) to start the loop again. 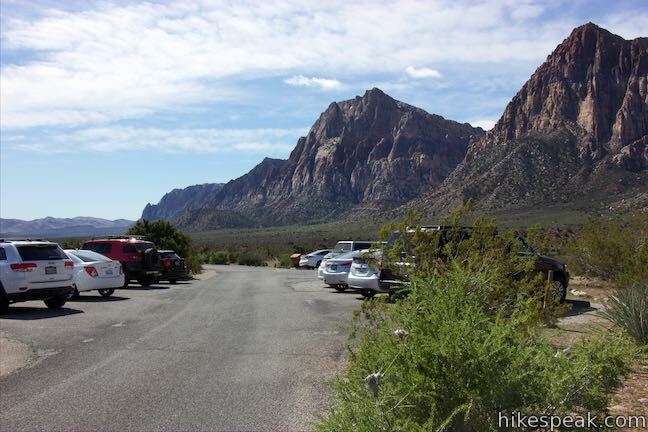 Make the most of Scenic Drive by stopping at all the places you want to visit in order. 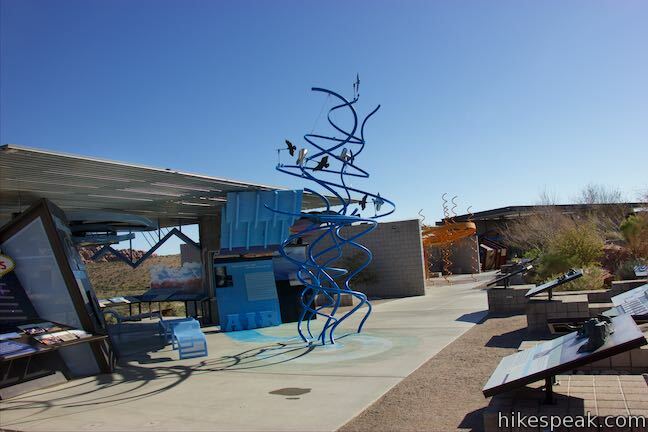 The park’s visitor guide lists which trails are available from each stop along Scenic Drive. 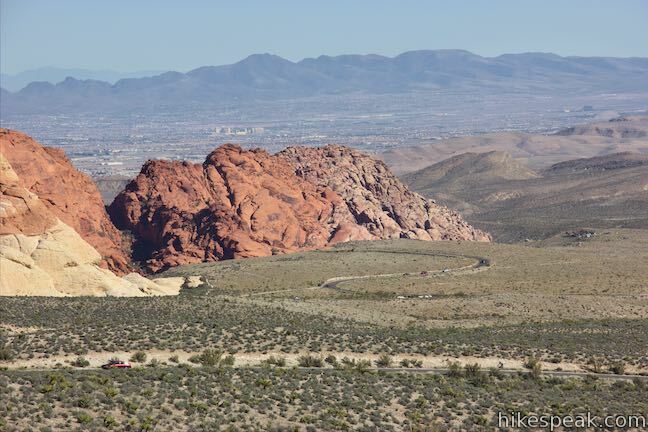 After the visitor center, Scenic Drive ascends along the Calico Hills, composed of impressive red-orange and tan sandstone. 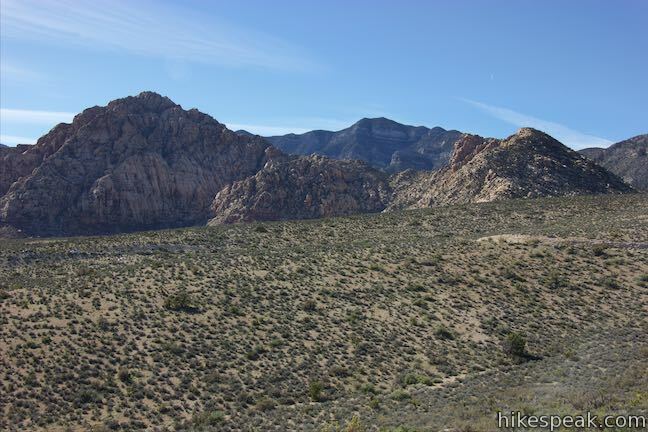 Stop at Calico I or Calico II for a hike in the Calico Hills. 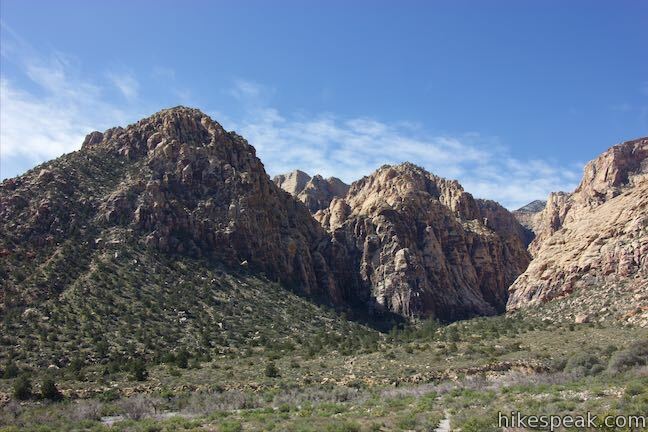 Next the road passes Sandstone Quarry Trailhead, the start of an excellent hike to Calico Tanks and a tough hike to Turtlehead Peak. The road heads farther uphill to High Point Overlook at the north end of the loop. 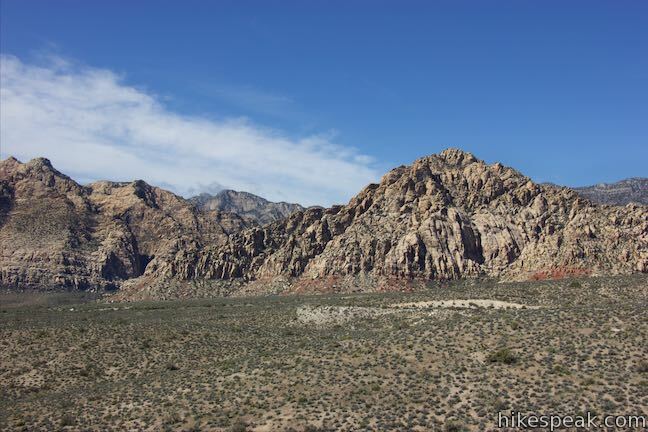 Stop here for views over the Calico Hills and down the road your came up toward Las Vegas. 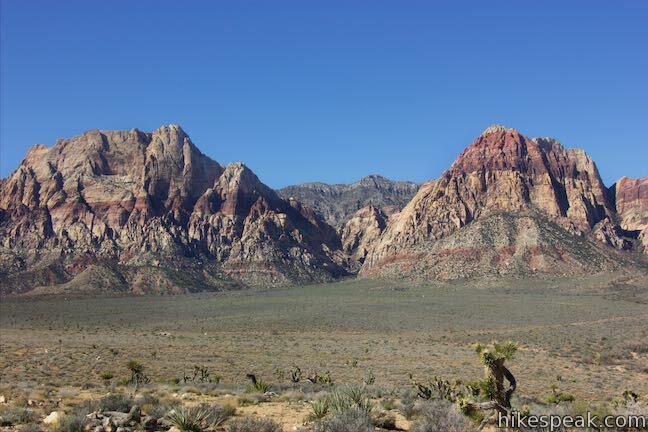 The Spring Mountains form an impressive wall of steep multi-colored peaks and ridges to the southwest. 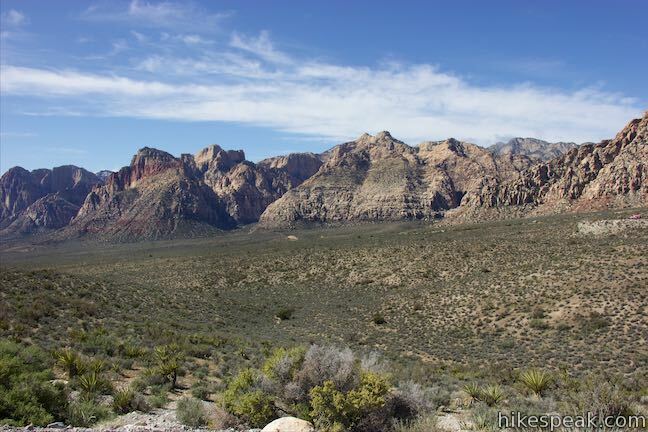 The road turns downhill from High Point Overlook, passing a spur to White Rock and an intersection with Rocky Gap Road, which can be used to reach Lost Creek Canyon Trail (where you might find a waterfall), Willow Springs Loop, and Willow Springs Picnic Area – all a short distance off the road. 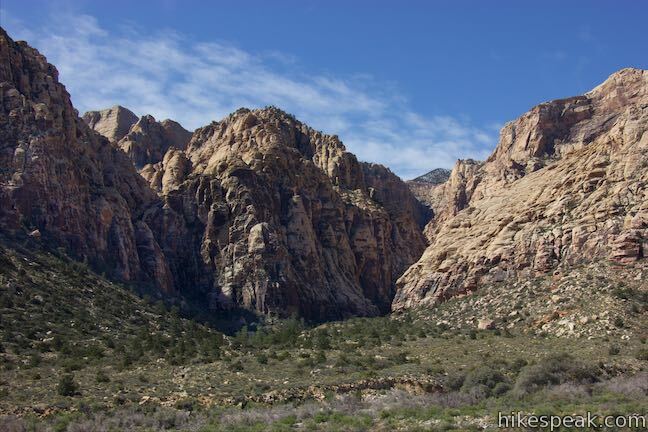 Scenic Drive then passes Ice Box Canyon Overlook, with views up an awesome-looking canyon in the Spring Mountains just to the west. 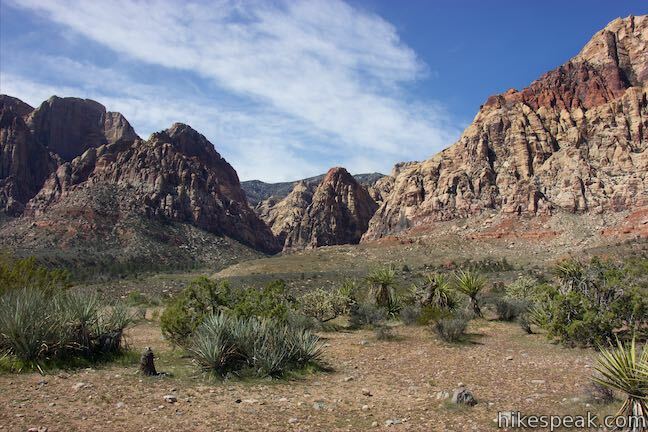 Due to unique conditions here at Pine Creek, scientists believe this area is a remnant biotic community. 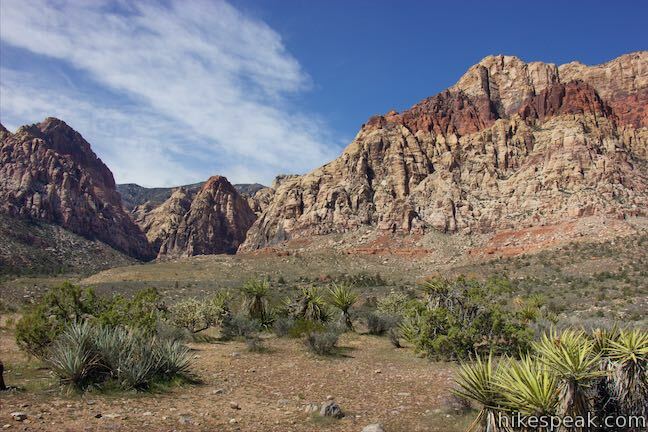 Less than one million years ago, much of the Las Vegas Valley may have looked like Pine Creek. Several plants are endemic to this riparian (water-fed) habitat including pine trees that may represent relic forests from the last Ice Age. 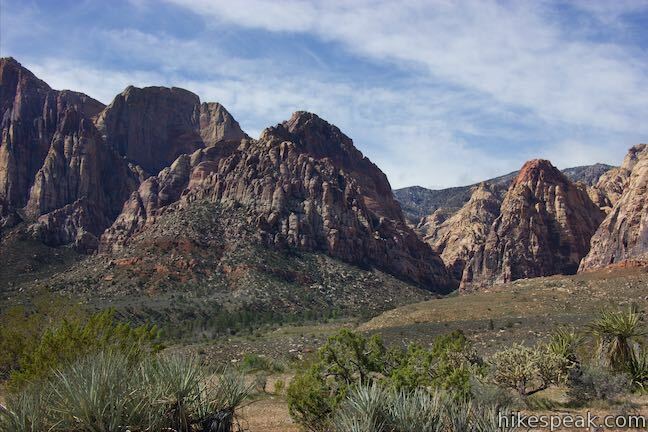 Leave Pine Creek Canyon and go down the last section of the road, passing a spur on the right to Oak Creek Canyon. 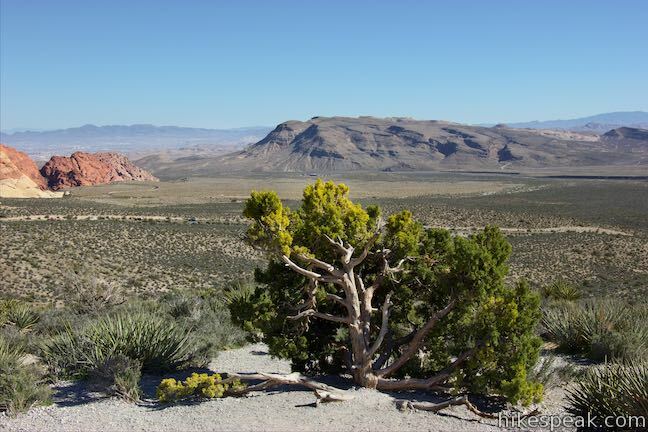 In the end, Scenic Drive meets Route 159. 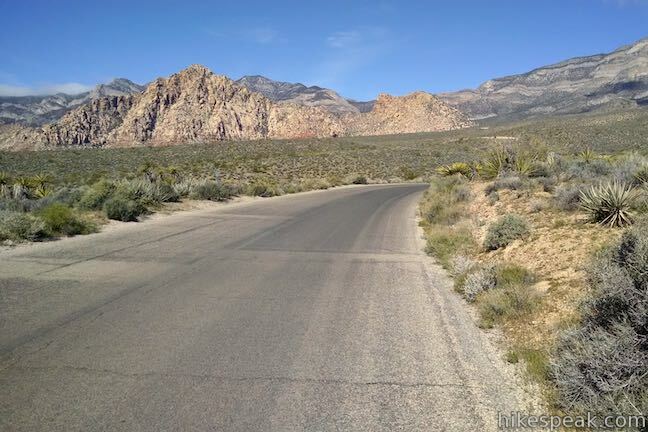 Turn right to go back toward the start of the loop, heading northeast toward Las Vegas. 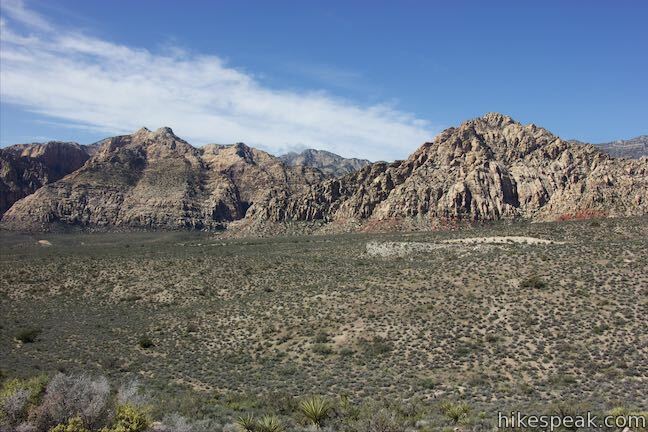 Almost immediately, the road passes Red Rock Overlook, on the left, which presents nice views of the Spring Mountains and the park you just passed through. 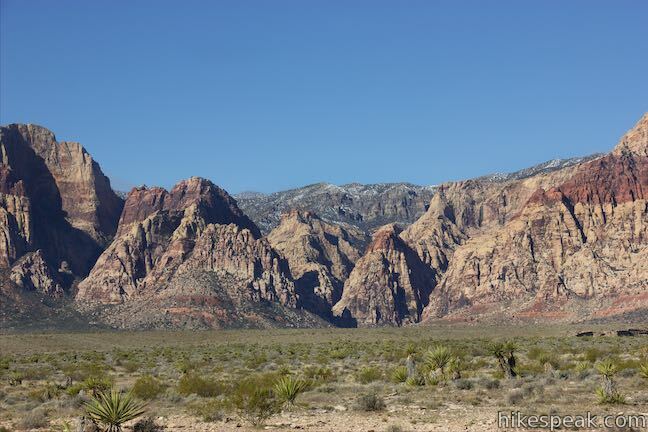 Scenic Drive goes through spectacular desert scenery and is a popular biking route. The road is two lanes wide with a right lane intended for bike use. 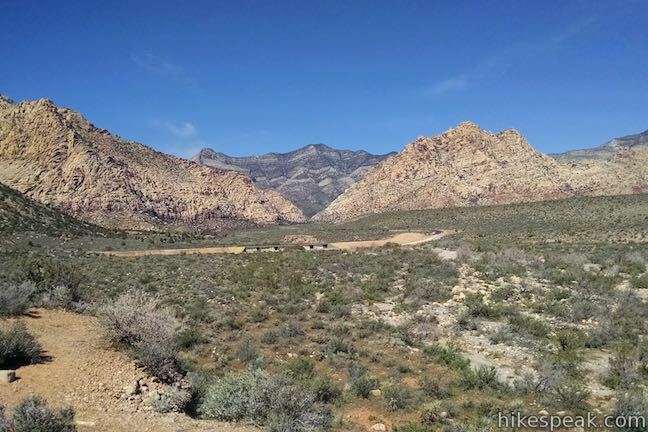 The two ends of Scenic Drive are connected by 2.2 miles on Route 159 to create a roughly 15-mile (if you pull off at a few of the viewpoints along the way). Where to begin? 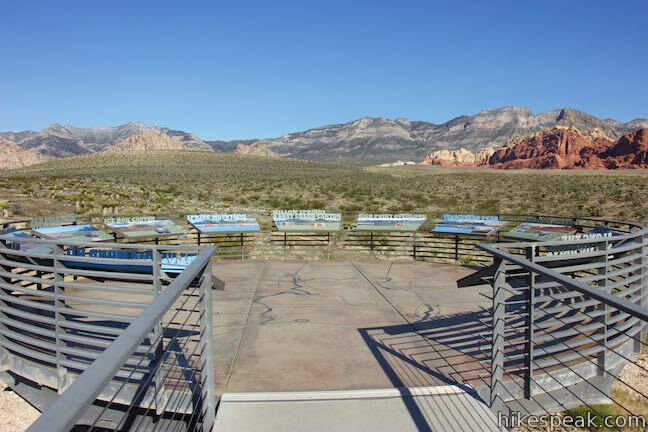 The obvious places to start the loop are from a parking area at the southwest end of Scenic Drive (where Scenic Drive ends), from Red Rock Overlook (located half a mile from the end of Scenic Drive along Route 159), and from parking on the shoulder of Route 159 outside the entry booth. 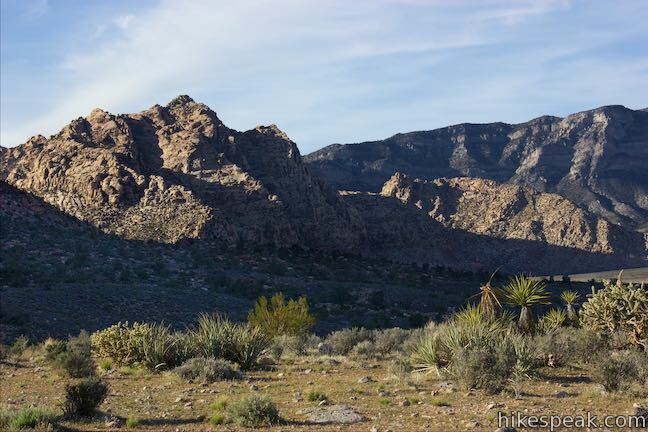 Those coming from Las Vegas often park near the corner of Charleston Boulevard (Route 159) and Desert Foothills Drive and bike 4.5 miles up to the start of Scenic Drive. A bike shop located in the shopping complex at this intersection offers bike rentals for those in need. 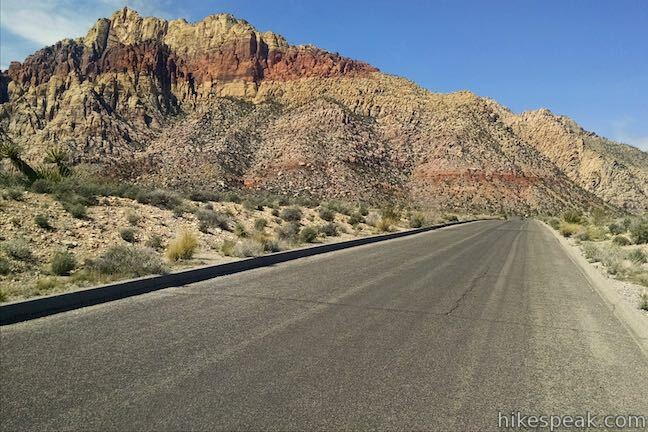 From Red Rock Overlook, bike 1.7 miles northeast, warming up along a fairly level roadway that is wide but does have fast moving traffic. 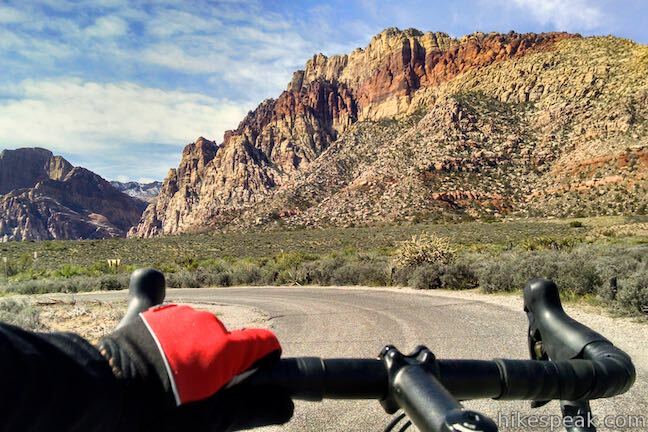 Turn left into the park entrance at the start of Scenic Drive and pay the $3 bicycle entry fee. The road is uphill now, gaining 980 feet over 4.7 miles to hit High Point Overlook. 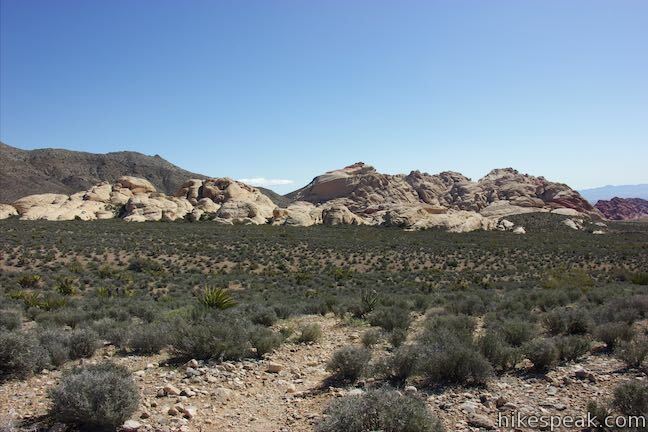 Along the way, the road goes downhill for a stretch past Sandstone Quarry, but it climbs again after that. 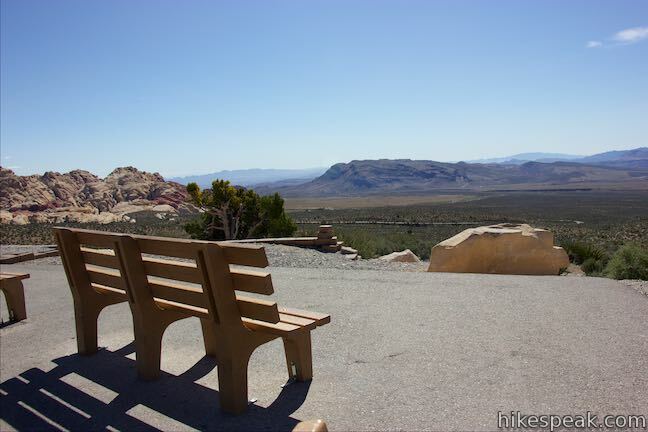 The broad views from High Point Overlook will be well earned! 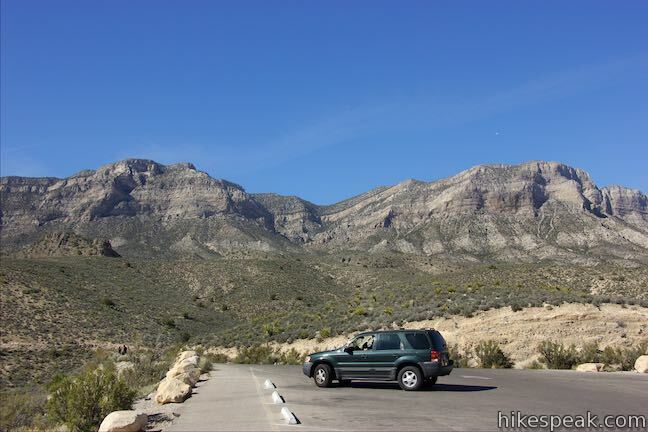 After High Point Overlook, Scenic Drive is easy, sporting fast descents and just a few short climbs. 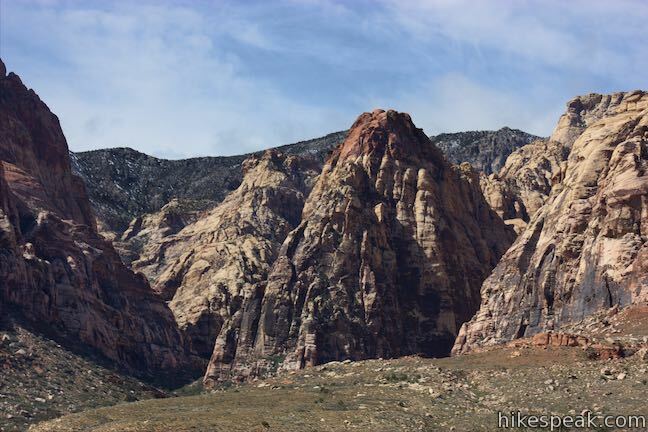 At the end of the road, turn left on Route 159 to ride back to Red Rock Overlook or the park entrance. 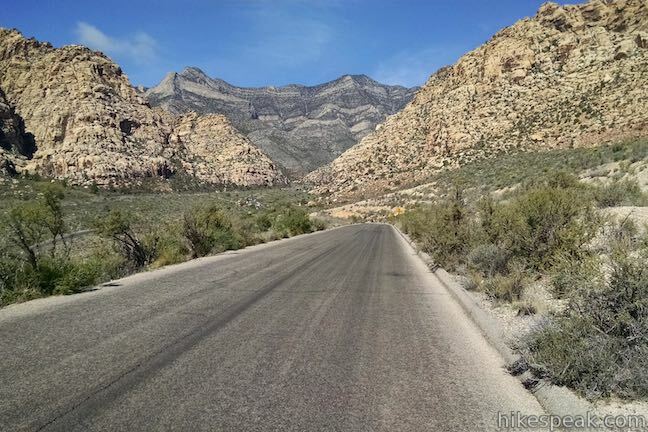 Scenic Drive provides a very scenic ride! 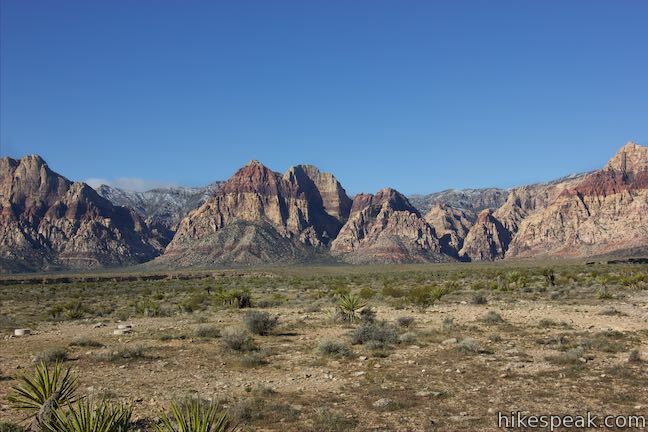 It is an excellent way to see Red Rock Canyon National Conservation Area. 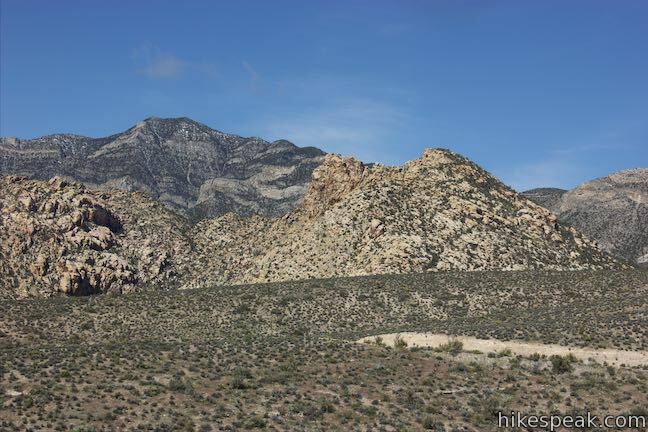 To get to Scenic Drive: From Las Vegas, take Interstate 15 to exit 42 and follow Route 95 west for 5 miles (heading toward Reno). 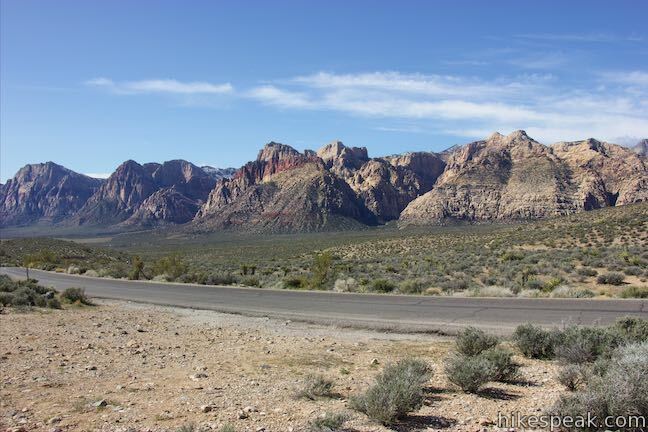 Take exit 81A for Summerlin Parkway and drive 6.5 miles, using a ramp on the right to get on Clack County Route 215 South. Drive 2.2 miles, taking exit 26 to reach an intersection with Route 159 (Charleston Boulevard). 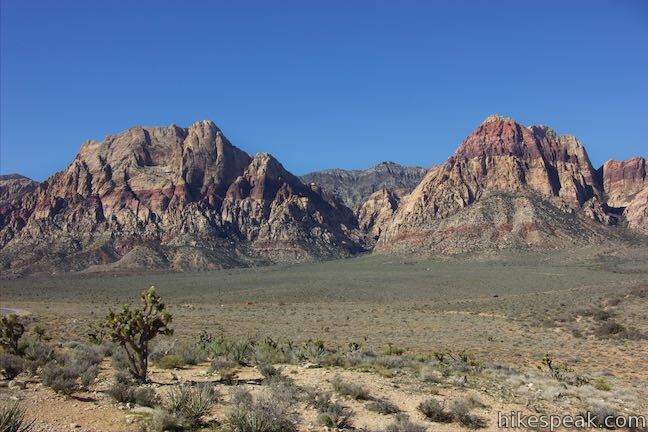 Turn right and drive 5.2 miles to the start of Scenic Drive in Red Rock Canyon. 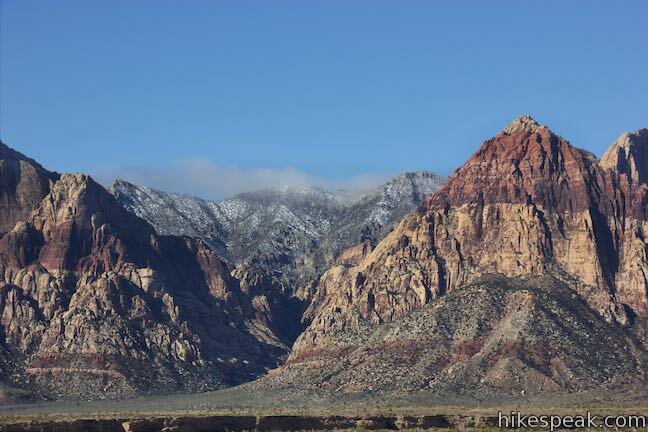 Turn right, pay the entrance fee, and begin up the road. These photos were taken in March of 2016. Click to enlarge. 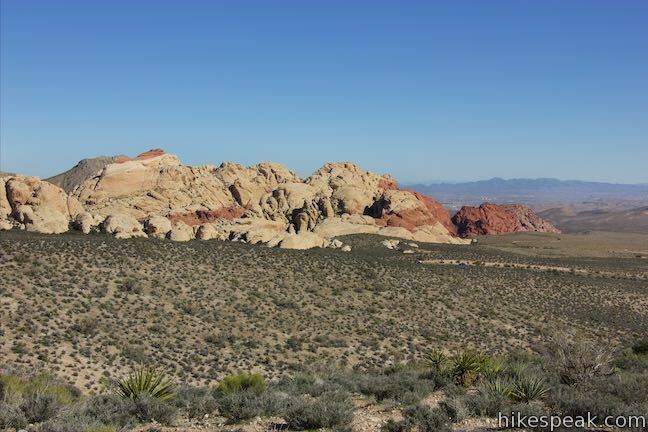 This hike of 0.8 to 2.75 miles or more explores dramatically shaped and colored sandstone formations in the Calico Hills near the start of Scenic Drive. 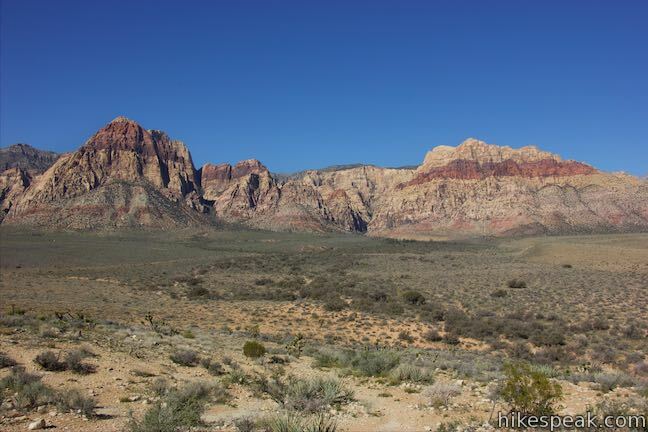 This 2.5-mile hike ventures up a colorful canyon to a pond in a sandstone-framed basin alongside a grand view of Las Vegas. 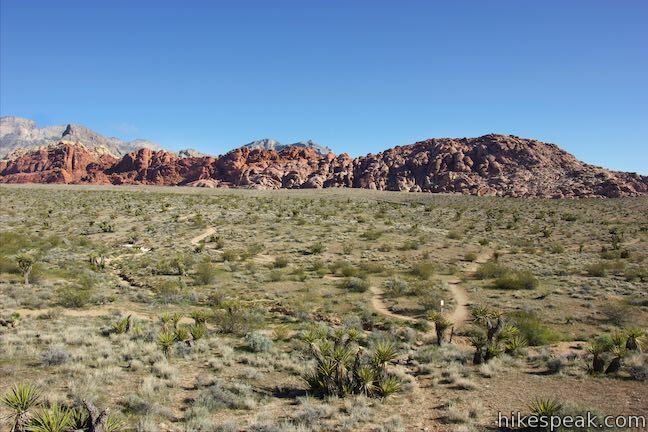 This easy 0.55-mile nature trail circles a meadow at the base of the Calico Hills and visits a small but relied upon spring. 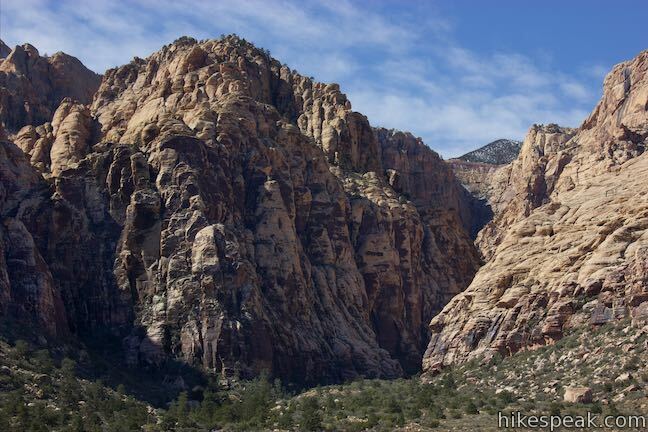 This short hike visits Lost Creek Waterfall, a seasonal waterfall in a steep canyon above Red Rock Wash. 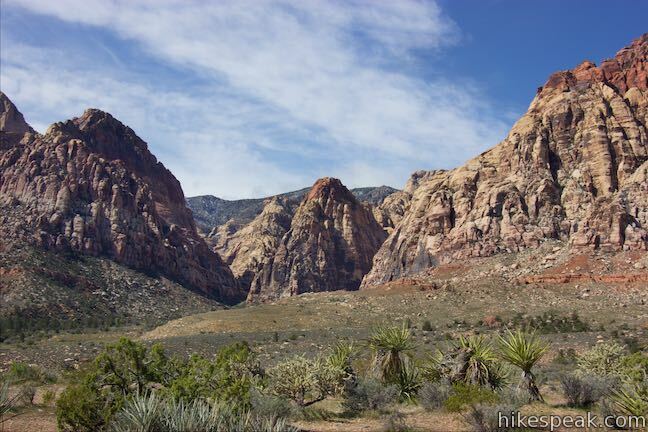 This 1 to 1 1/3-mile circuit travels along Red Rock Wash, exploring desert landscapes, Native American rock art, and potentially a seasonal waterfall. 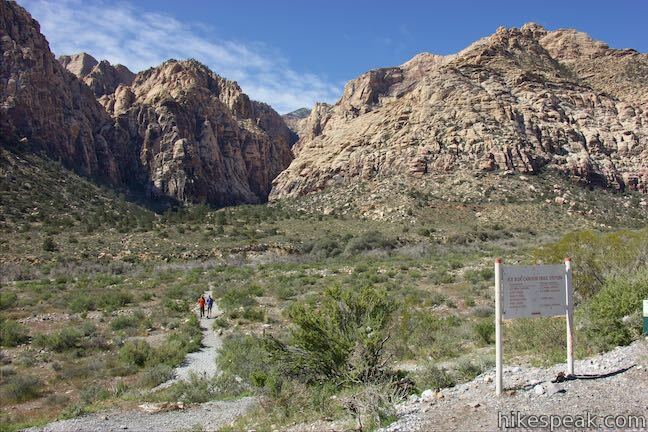 Explore more trails in Nevada and the picturesque parks around Las Vegas. 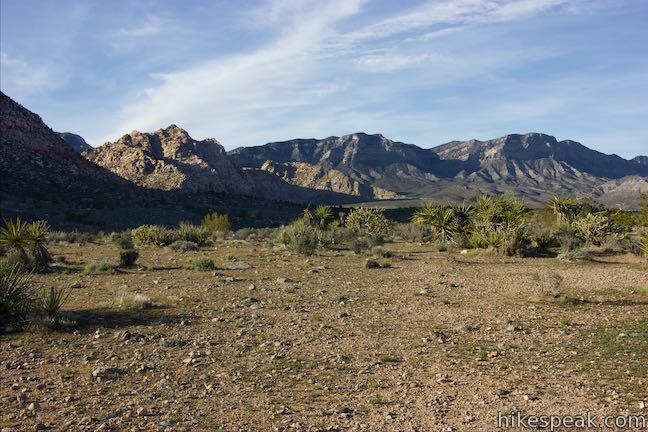 Red Rock Canyon National Conservation Area has one developed campground with 72 sites that have shade ramadas, picnic tables, fire rings, barbecue grills, drinking water spigots, and vault toilets. 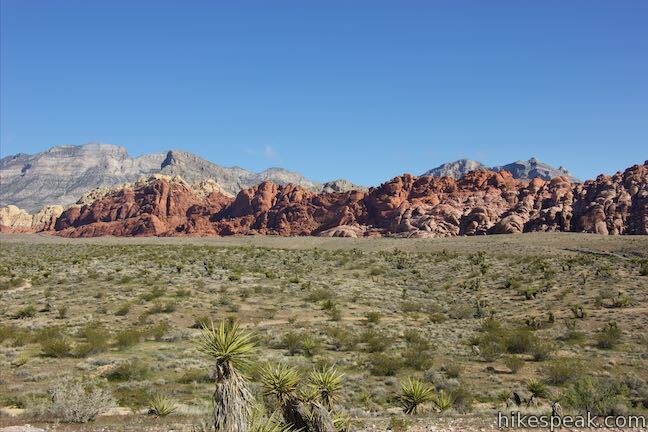 Valley of Fire State Park has great places to camp surrounded by formations of red sandstone.